Lesson learned. When several other book bloggers who often have similar tastes in books as I do rave about a certain book or series -- I need to read them! 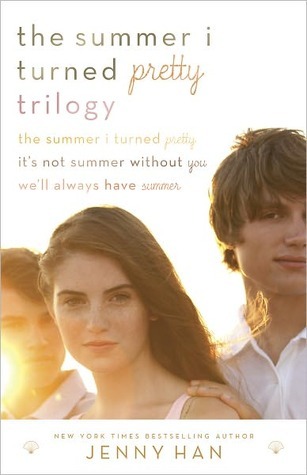 I'd had Jenny Han's Summer series: namely, The Summer I Turned Pretty, It's Not Summer Without You, and We'll Always Have Summer, on my TBR (to be read) list for quite awhile. When the summer started, I told myself that I would read them sometime this summer. So when I found out that my local library had the CD for The Summer I Turned Pretty, I picked it up, along with the second book. First of all, I want to take a road trip to Cousins Beach right now. Han describes a cute little beach town where everybody knows everybody and all is laid back. She paints a beautiful picture in the readers' minds of lazy summer days filled with lying by the pool, walking along the beach, and eating a lot of junk food. Belly's summer world is so cozy, so intimate, so imperfect that it envelops you and you want to be there. "Jeremiah is totally your type! It's so easy to be around him, he's the life of every party. And he's sweet, too. It's too bad he's always surrounded by a ton of admirers…things can get a little crowded." I would have to say that It's Not Summer Without You is my favorite book in the series. I loved The Summer I Turned Pretty, but I didn't love the girl who was doing the narration on the CD. I was so invested in the story, though, that I ditched the CD and finished reading it on my Nook. I immediately picked up the second book and started reading it. I got through one chapter, since it was pretty late by that point, and went to sleep. The next morning I woke up and read the entire book in a few hours. I went out for about an hour, came back, and read the entire third book. Book 3 was based around a storyline that I didn't really like. I understand why Han brought it in, but it seems a bit unrealistic to me. I didn't like it, but I loved all the characters, and that's what redeemed the book for me. So now I am becoming one of those book bloggers who is raving to you about a series. Read the Summer series! I loved it, and I think you will, too. I keep hearing awesome things about this series and it's been on my wishlist for a while. I just finished the third one last night and loved it as well! Such an amazing series.